Engineered Wood Floors. 2-layer and True Balanced 3-layer engineered flooring. Engineered Wood Floors. Balanced 3-layer engineered flooring. When it comes to real hardwood flooring, there are two options: solid hardwood flooring and engineered hardwood flooring. Because the look and feel of solid versus engineered hardwood is virtually identical, the decision on which one to purchase and install is not a question of personal preference, but a question of cost, climactic factors and other practical considerations. There are two types of engineered hardwood floors: 2- and 3-layer. 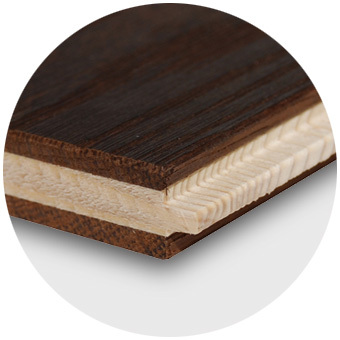 Czar Floors 2-layer engineered floors are made with a top layer of solid sawn 4mm wood. The lower layer is made of Baltic Birch 9-ply plywood. 3-layer engineered floors have a identical top and bottom layers (Please read the section, “true balanced engineered floors," below for more information). Multiple layers are bonded together under pressure. How are Czar Floors' engineered wood floors better? There are huge differences in quality in engineered wood flooring, and consumers don't know how to compare apples to apples. The first thing is to look at the composition of the flooring: What is it made out of? Is it a low-grade, three-ply softwood plywood or a high quality plywood (such as the marine-grade Baltic birch used in our flooring)? 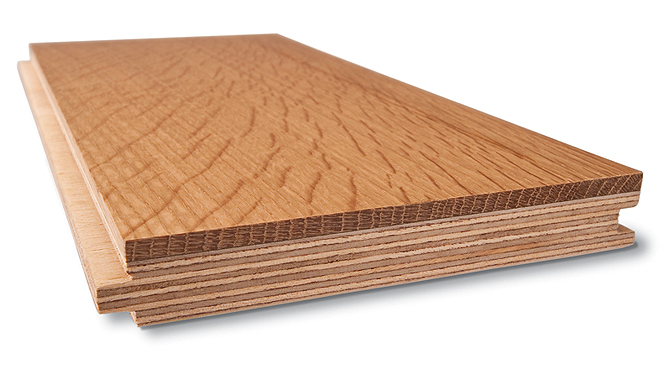 Lower-grade plywood has a greater chance of delamination, where the layers come apart. You don't buy a Mercedes-Benz and put the cheapest tires on it, and the same is true with engineered wood flooring. The adhesives that we use are a formaldehyde-free composition, ultra-low VOC. The floors are produced entirely in the the U.S with domestic adhesive on precise German-made equipment. The top wood layer is the same top quality material used in our solid wood products with proper Moisture content (6%-8%). Where to use/not use engineered wood floors? It is preferable to use engineered floors in areas with a higher relative humidity, such as basements, kitchens, near shores, etc. Engineered flooring will outperform solid flooring there, meaning you can use a wider-width product without seeing dimensional changes as much. The recommended RH (Relative Humidity) is 35% to 55% for our engineered floors. Particularly in very dry climates, such as Las Vegas, with an average RH of about 30%, as well as installations over radiant heat, an engineered floor must be chosen carefully. The home must have a humidification system that can maintain the floor at the required range. In such cases, you may consider 2-layer engineered floors made with Rift/Quartered sawn wood or True Balanced 3-layer engineered floors (see below) instead. True Balanced Engineered Floors - a better option! A better option than typical 2-layer construction is Balanced 3-layer engineered floor. This type of floor achieves outstanding dimensional stability, and allows for installations at, above or below grade, radiant heated floors. Balanced engineered floors are made with a top and bottom wood layers of the same wood species, 4mm thick. The middle core is softer material. It allows the top and bottom layers to expand and contract at the same rate, eliminating some of the shortcomings of standard 2-layer engineered floor. Such construction can allow wider widths and longer lengths than would otherwise be typically possible. The standard middle core is Baltic Birch plywood. A cross-banded Maple middle core is also available for even better stability. The ultimate, unparalleled dimensional stability can be achieved using Rift/Quartered sawn oak as top and bottom wood layers and cross-banded Maple as a middle core. In our tests, we subjected this type of floor to severe abuse. Floors were installed over a concrete slab and flooded. After drying, the floor stayed flat, with no visible adverse effects. Test boards were kept outside in cold temperatures for hours and then warmed to room temperatures. The boards retained their geometry through all of these tests. What type of floor can be made as engineered? Almost every type of floor and wood species we sell can be made as engineered. This includes random length strip flooring, herringbone, parquet, etc. Our wood inlays and medallions are inherently all made engineered by default. In addition, we offer two thickness options specifically for 2-layer engineered flooring: 5/8" and 3/4". (Balanced floors are only available in 3/4".) It has the same 4mm top wood layer. The only difference is in plywood base thickness. Please contact us with any questions about proper selection and installation of engineered floors.